Here’s another good writing assignment for middle or high school aged students. Feel free to use it; it’s worked for us at WriteAtHome over the years. The rest is up to you. 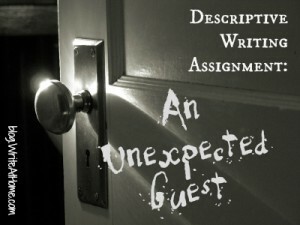 Write a paper that describes your unexpected guest. What does he look like? How is she dressed? How does he speak? Move? Behave? Focus on revealing and vivid details. Put the reader in your shoes and bring this person to life. He or she can be someone familiar or totally imaginary, creepy, interesting, or hilarious. You decide. Remember, the idea is not to tell a story, but to describe. Your visitor can and should move, however. He may speak as well. Those things describe by showing, rather than just telling. Feel free to describe the scene as well, but focus on the visitor. As always, I’d love to hear your thoughts. Please leave a comment below. I am hoping to try this with my year 7 and 8 students tomorrow :D. I will let you know how it goes. Do you have any character descriptions that you would suggest that students read before they begin to write? I think students should see how a writer writes a well developed description. What do you suggest? That’s a great suggestion, Aisha. I don’t have any that come to mind, but it would be a good idea to have a few good examples ready to show students. Maybe I’ll do some looking.